If you’ve ever unfortunately been diagnosed with OSA, or Obstructive Sleep Apnea, you know that the principal means of managing the condition is through the use of a Continuous Positive Airway Pressure, or CPAP, machine. Yes, you can get surgery of the nose, upper and/or lower throat, or even skeletal system to address your OSA, but some people have complained that this has not worked for them. Besides, with the surgical route, you are sometimes talking about a procedure that cannot be undone, such as the removal of your tonsils. You can also try an oral appliance, which can be cheap or extremely expensive depending on the type, but in many cases insurance companies don’t cover these as they are not in fact widely accepted as treatment options yet. You know, insurance companies know best and all that jazz. Generally speaking, CPAPs are small electronic machines, often about the size of a shoebox, that you have to plug in to use. They provide you with air through a hose that attaches the machine to a mask of some sort, either a full face mask, an over the nose mask, or a straight in-the-nostrils setup. The pressure from the incoming air keeps your airways open, ideally preventing you from the hallmark fall-asleep-stop-breathing-wake-up-start-breathing-fall-asleep endless loop and enabling you to finally get some restful sleep. A built in water basin can be filled to humidify the air you breathe in if you find yourself getting dried out, but this is above and beyond the core competency of the machines. The devices, like those in the Phillips Respironics line, are surprisingly quiet considering that they’re pumping pressurized air into you, and the machine along with the rest of the gear can fit into a small shoulder bag the size of a large camera bag. The whole setup isn’t difficult to haul around at all, in fact, making it easy to transport the equipment while you’re traveling, for instance. What’s not so pleasant about the setup is that you have to haul a f@#$%*& machine around, find a place to plug in and connect to the grid, then connect yourself to it via a hose and some kind of freakish mask strapped to your face utilizing various bands around your head so that you look like you’ve ended up on another planet the air of which is not breathable by humans. Not that comfortable, at least until you get used to it. God forbid you should have to pee during the night; all that futzing around with the mask you did to get it seated properly will have been for naught, nevermind the fact that when you take the mask off it’s not so quiet anymore, waking up your bedmate in the process. Or, you might discover you’re one of those proactive sleepers who deals with issues in their sleep, i.e. you rip the mask off your face while you’re dead asleep because it has pissed off your subconscience, again waking up your bedmate in the process and leaving you defenseless against your sleep apnea. Even if your subconscience isn’t involved, masks can be downright uncomfortable, causing condensation to form or drip onto your skin under the mask or causing prolonged irritation to the skin or nostrils. Sounds like fun, we know. Do they make smaller CPAP machines that are even more portable? You bet they do. Take something like the Z1, which claims to be “the smallest, lightest, most integrated cpap machine available.” Quiet, light (around 10 ounces), and with an optional integrated battery system, the Z1 certainly lightens your load, allowing you to use it even while camping or on a flight. You’ll still need to futz with hoses and masks, however. Soon though, you won’t have to stop at something like the Z1. With an Indiegogo campaign that started on the 15th of this month and is already 597% funded with 27 days to go (!) as of this article’s publication, inventor Stephen Marsh is beginning the process of putting the Airing, a tiny CPAP machine that will weigh less than one ounce, in your hands and literally up your nose. This revolutionary new device might make you look like a bull wearing a giant nostril ring, but don’t worry, it looks like it’ll be worth it. 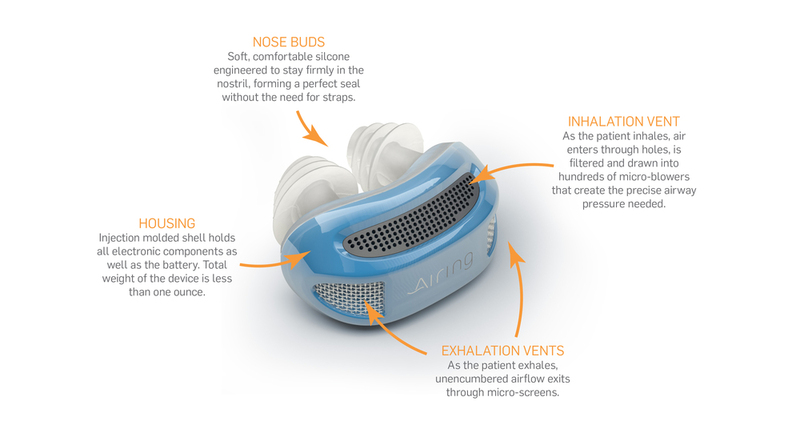 Mask free, hose free, cord free, tank free, and ridiculously small, the Airing may provide the answer to many problems proposed by more traditional CPAP setups. Utilizing “micro-blower” technology that stands on the shoulders of Marsh’s research in the area of Micro Electro Mechanical Systems (MEMS), specifically with respect to micro-fluidic pumps and Marsh’s improvement of said pump design (after all, pumps can move air, not just fluid), the battery-powered, injection-molded Airing has one inhalation vent to filter incoming air, two exhalation vents to eject used air, soft silicone nose buds (also known as pillows), is full of micro blowers that provide the air pressure needed to keep your airways open, and reportedly has a run time of over 8 hours. The intent is not only to provide you with a solid night of sleep, but also to encourage you to use a CPAP device in the first place – it is estimated that around 50% of CPAP users stop using their CPAPs within one year, and who can blame them. The utilization of the “Roll-to-Roll (R2R)” manufacturing process will ensure that each Airing can be produced on the cheap, very cheaply indeed as the device is meant to be disposable, meaning no cleaning of masks, hoses, or other components of a more traditional CPAP apparatus! Use an Airing one night and toss it, then use a new one the next night. There is some indication that the devices will be recyclable, if you’re the type to worry about yet more waste being created through the production of disposable goods in the name of progress and convenience, but we would hope for a non-disposable version someday. People are already questioning its ability to provide relief in such a small size for the whole night via nothing more than battery power, and they are rightly pointing out (as is inventor Marsh on the Indiegogo campaign page) that it will need FDA approval to be sold. Also, it won’t have a humidifier, potentially drying out your nose and airways. Doubters aside, we’re eager to see the Nosering, errr, Airing in its final form. While we’ll have to wait to see how the funding campaign finishes, and then some time thereafter for actual production if successful (in the year 2017), we’re already daydreaming about counting sheep and enjoying better sleep.